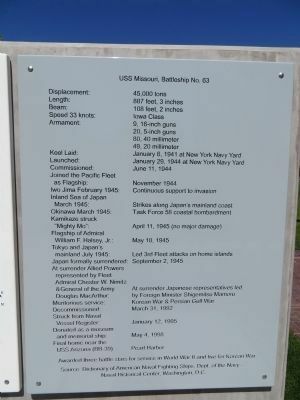 World War II began for the United States with a surprise attack by the Japanese on Pearl Harbor on December 7, 1941, and ended in Tokyo Bay on September 2, 1945. 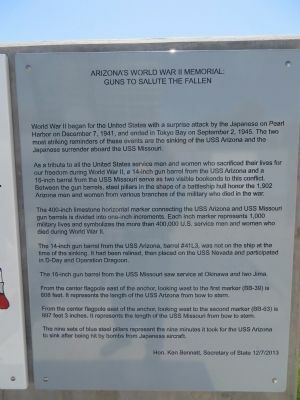 The two most striking reminders of these events are the sinking of the USS Arizona and the Japanese surrender aboard the USS Missouri. 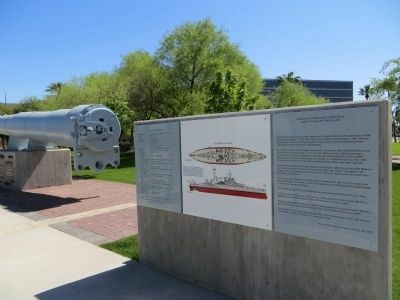 As a tribute to all the United States service men and women who sacrificed their lives for our freedom during World War II, a 14-inch gun barrel from the USS Arizona and a 16-inch barrel from the USS Missouri serve as two visible bookends to this conflict. 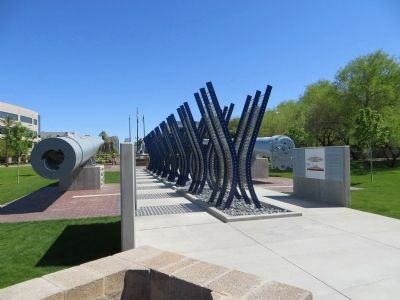 Between the gun barrels, steel pillars in the shape of a battleship hull honor the 1,902 Arizona men and women who died during World War II. 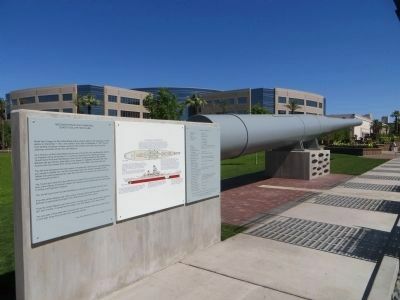 The 14-inch gun barrel from the USS Arizona, barrel #41L3, was not on the ship at the time of the sinking. 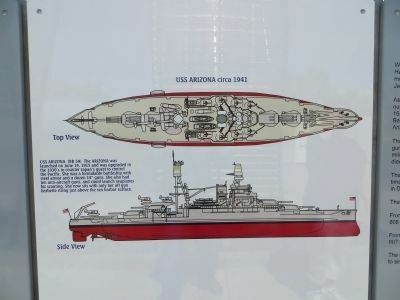 It had been relined, then placed on the USS Nevada and participated in D-Day and Operation Dragoon. From the center flagpole east of the anchor, looking west to the first marker (BB-39) is 608 feet. It represents the length of the USS Arizona from bow to stern. 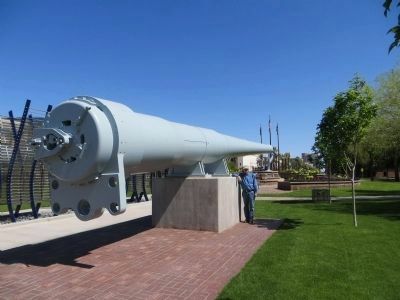 USS Arizona marker and 14-inch gun. to the second marker (BB-63) is 887 feet. 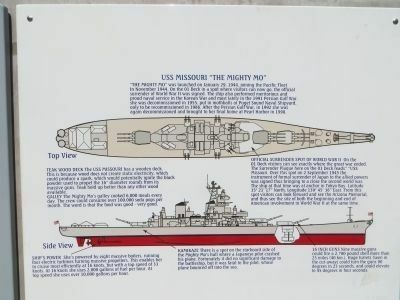 It represents the length of the USS Missouri from bow to stern. 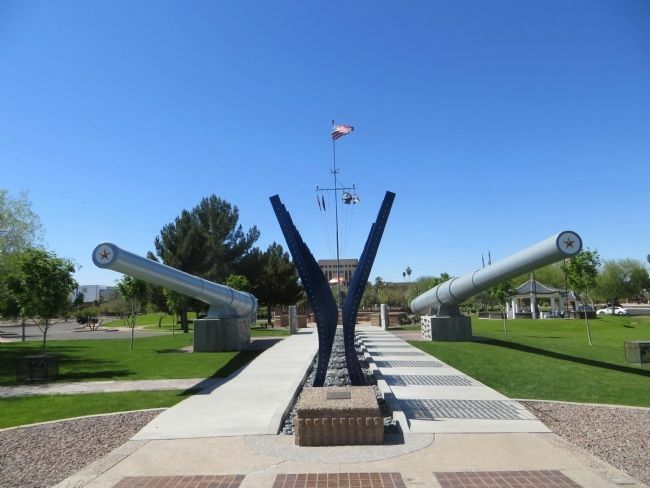 The nine sets of blue steel pillars represent the nine minutes it took for the USS Arizona to sink after being hit by bombs from Japanese aircraft. Location. 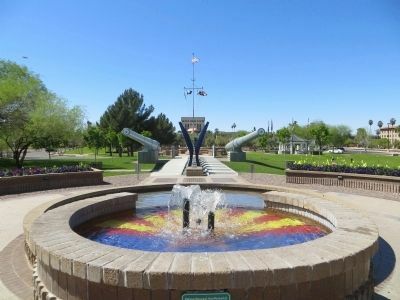 33° 26.887′ N, 112° 5.62′ W. Marker is in Phoenix, Arizona, in Maricopa County. Marker can be reached from West Adams Street. Touch for map. Marker is at the east side of Wesley Bolin Memorial Park. Marker is in this post office area: Phoenix AZ 85007, United States of America. Touch for directions. Other nearby markers. At least 8 other markers are within walking distance of this marker. U.S.S. Arizona Signal Mast (a few steps from this marker); The Arizona Korean War Veterans Memorial (within shouting distance of this marker); Arizona's U.S.S. 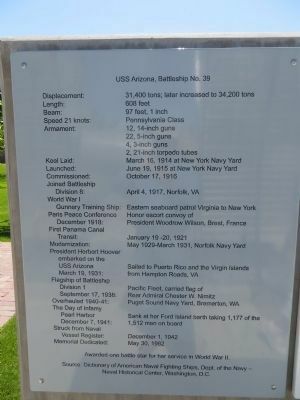 Arizona Memorial - In Memory of the Gallant Men (within shouting distance of this marker); Father Albert Braun O.F.M. 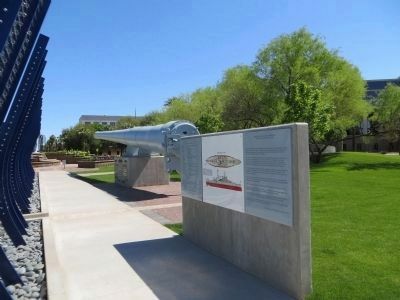 (within shouting distance of this marker); Jewish War Veterans Memorial (about 300 feet away, measured in a direct line); Vietnam Veterans Memorial (about 300 feet away); Memorial to Arizona Confederate Troops (about 300 feet away); Navajo Code Talkers (about 400 feet away). Touch for a list and map of all markers in Phoenix. 3. USS Missouri and 16-inch Gun. More. 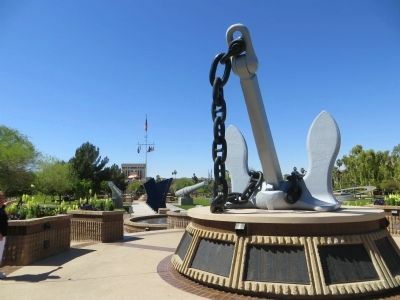 Search the internet for Arizona World War II Memorial. Credits. This page was last revised on June 16, 2016. This page originally submitted on March 20, 2014, by Bill Kirchner of Tucson, Arizona. This page has been viewed 885 times since then and 13 times this year. Photos: 1, 2, 3, 4, 5, 6, 7, 8, 9, 10, 11, 12, 13. submitted on March 20, 2014, by Bill Kirchner of Tucson, Arizona. • Syd Whittle was the editor who published this page.